So my lunch time eats last week were pretty random. I’m already getting a little stuck coming up with easy ideas for lunch (mostly because I’m not bothering to make something special just for lunch). So here are a couple of things I put together. If you have lunch ideas, pass them my way! Also, if you have a thermos that you love I’m in the market and could use recommendations! Last week I made some hard boiled eggs. I like my eggs a little underdone so the yolk isn’t all dry and boring. I packed a little container of salt and pepper and dill (love dill!) 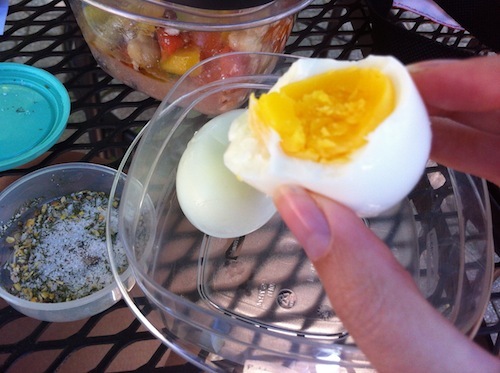 to dip my eggs in, then peeled and packed two hard boiled eggs in a tupperware. Easy and tasty. Paired with some Greek Salad and an apple, it was quite the tasty meal. It’s also convenient if you like to break your meals up into multiple snacks, or have to grab bites in between working. I also made some Curried Egg Salad (my usual egg salad with about 1/2 tsp curry powder for 6 eggs) with my hard boiled eggs, so I had that on a sandwich one day (I forgot to take a picture since I ate lunch with my boss). I paired that with some steamed broccoli from the night before and some carrot sticks with hummus. When I really ran out of ideas, I went to the trusty stand-by of peanut butter and jelly. I’m a big fan of PB&J, so really it was more of an excuse to get to eat than a lack of inspiration. 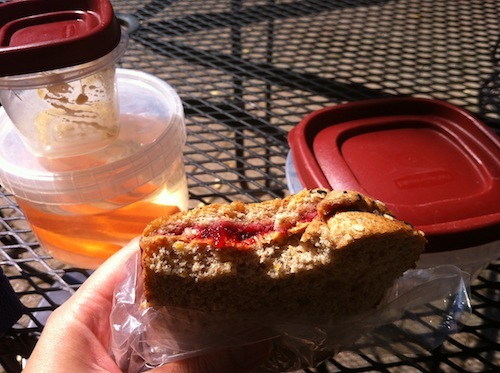 The hardest part about having PB&J for lunch is that I’m not getting my veggies in! So I packed some carrot sticks and hummus, an apple with sharp cheddar cheese and had my PB&J as dessert.